A juicy kiwi makes a great dessert especially when it comes with all the following health benefits. 1) It is a high antioxidant food that fights free radical damage. 2) As you know collagen which is a protein that maintains the skin, muscles, bones and tendons is dependent on Vitamin C which kiwi has plenty of. 3) Since it is high in Vitamin C it is beneficial to improve respiratory health. If you suffer from asthma try adding kiwi to your diet. 4) Kiwi has 171 mg of lutein in one large fruit. Lutein protects the skin and also protects the eye by filtering out damaging short- wavelength UV light. 5) Kiwi has some anti-inflammatory properties and helps reduce complications related to IBS. 6) The potassium in Kiwi helps lower blood pressure and is a vasodilator, relaxing the blood vessels throughout the body. Studies show that people who ate Kiwi on a regular basis have 15 percent lower triglyceride levels compared to those who did not . 7) Kiwi has a lot of Vitamin K.
8) The serotonin in Kiwi has been shown to increase sleep time and sleep efficiency by 13 and 5 % respectively. 9) Kiwi is among some of the best cancer – fighting foods available in nature. 10) Both green and golden varieties have antifungal and antibacterial capabilities. 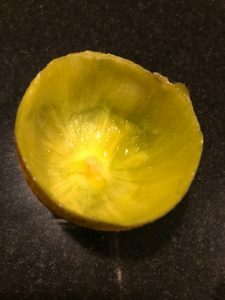 The seeds are what provides the antibiotic activity and a protein actinchinin in the golden variety has the antifungal property. Some reasons I love kiwi are because they are a beautiful fruit when cut up and it can be added to smoothies, salads or just eaten plain. 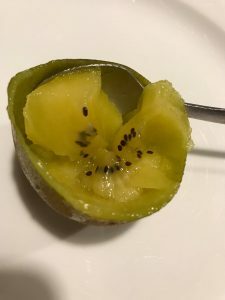 The scooped out Kiwi flesh tastes great but guess what the skin is edible too and has lots of fiber, phenolics and vitamins.